Spinal anatomy is a remarkable combination of strong bones, flexible ligaments and tendons, large muscles and highly sensitive nerves. It is designed to be incredibly strong, protecting the highly sensitive nerve roots, yet highly flexible, providing for mobility on many different planes. Most of us take this juxtaposition of strength, structure and flexibility for granted in our everyday lives— until something goes wrong. Once we're in pain, we're driven to know what's wrong and what it will take to relieve the pain and prevent a recurrence. This is often caused by Simple Sprains, Postural Problems, and Mechanical Imbalance. The cause of the pain is thought to be muscular and not due to an obvious pathological process. Investigations are usually normal or may show normal age related changes in the spine. Episodes are usually self-limiting, although some people may need treatment with Spinal Manipulation and Exercises for back pain. Osteopaths often call this form of back pain Segmental Spinal Dysfunction, meaning that a segment or segments of the spine have areas of muscle spasm associated with restricted joint movements. Dysfunction implies that the area is not functioning properly without implying that there is overt pathology i.e. muscle spasm rather than spinal arthritis. Segmental Spinal Dysfunction can frequently cause referred pain to other parts of the body mimicking other medical complaints. This on the other hand may have a variety of causes. Investigations and tests often show relevant abnormalities in the spine. This type of spinal pain is often more severe and long lasting than simple back pain. There are often associated psycho-social problems surrounding the pain issues, which make treatment difficult. The exact cause of the chronic back pain is not always known, and this can cause difficulty with predicting the outcome of treatment for it. For most people complete back pain relief is not possible. Click on the other links above for more information. 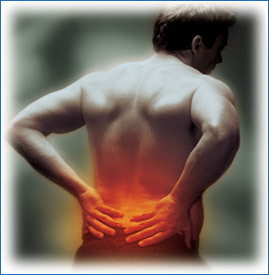 See Referred Back Pain where the cause of the back pain is not the spine, being referred from other areas of the body. See below for referred pain patterns to other areas of the body. Examples of complex spinal pain include annular tear, disc prolapse (bulging disc), spinal stenosis, foraminal stenosis, and spondylolisthesis. CRPS involves changes in skin temperature -- skin on one extremity can feel warmer or cooler compared to the opposite extremity. Skin color changes also are apparent as the skin is often blotchy, pale, purple or red. The texture of skin also can change, becoming shiny and thin. People with syndrome may have skin that sometimes is excessively sweaty.